Promise Technology today announced the launch of its second-generation personal cloud device, the Apollo Cloud 2 Duo. Like the company's original Apollo product, the Cloud 2 Duo is designed to provide a network-attached storage solution to families and small businesses who want the cloud's ease of use with the security of local storage. The Cloud 2 Duo offers double the storage capacity of the original Apollo models at 8TB, but continues to feature a sleek, compact white housing that blends easily with any decor. Promise Technology has designed its Apollo Cloud products to be simple and easy to use right out of the box, so customers do not need to have networking experience to get their personal clouds up and running. It plugs in and then is accessed through Mac and iOS apps, which are also being refreshed with new functionality. 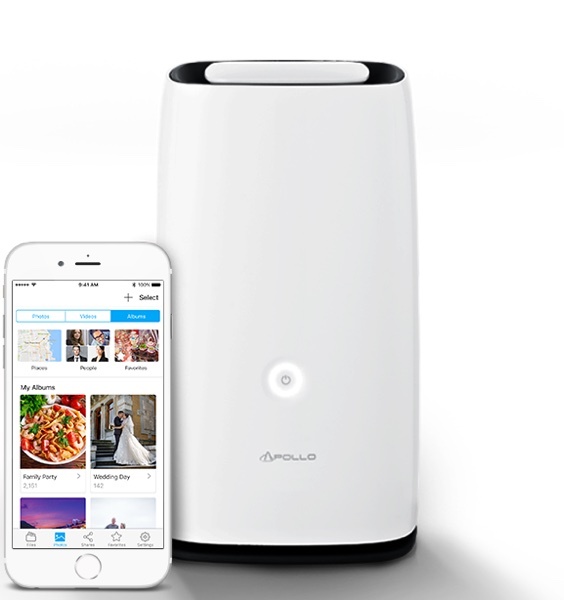 The Apollo Cloud 2 Duo does not require monthly fees because it's a cloud storage solution connected to a home WiFi setup. With the Cloud 2 Duo, all of a user's files are accessible on any device, but they're safe because they're stored on a local device rather than a remote server. Up to 40 people can use a single Apollo Cloud 2 Duo, and with 8TB of space, there's enough for the whole family to store all of their files in the cloud. Files stored on the Cloud 2 Duo stay synced and can be shared with others just like files hosted on a third-party cloud service like Dropbox. "In launching our second-generation product, we designed the Apollo Cloud Duo with careful consideration and our consumers needs in mind," said Justin Cleveland, Promise Technology's Director of Biz Dev -- IoT. "Aligning with our main goal to redesign storage and sharing, the Duo is easy to use and ensures content is always with the consumer -- whether they are at home or on-the-go." Inside the Cloud 2 Duo, there's a 1GHz Marvell Dual Core processor and the aforementioned 8TB hard drive. The hard drive can be configured in RAID0 for more storage space or RAID1 for 4TB of storage and a mirrored backup. Promise Technology has also built in support for hot swappable hard drives so storage can be switched out in just a few minutes. Apollo Cloud 2 Duo features include quick camera roll backup for your iPhone or iPad, photo organization with location and facial recognition support, and support for Time Machine for Mac backups. Promise Technology is selling the Apollo Cloud 2 Duo for $449, and it is available for purchase starting today on the Promise website. Is it possible to get 2 of these, put them in two different locations, and have them sync with each other? According to Promise Technology I've been using the cloud since the late 80's. "Apollo Cloud Mirroring allows you to sync all of your data and configurations to another Apollo in a different location anywhere in the world." Fair enough but to be specific, to me they always seem under powered (both CPU and RAM) for the price, especially if you do things like transcoding for a media server rather than just a file server. I guess the one perk is they can do an AFP share for Time Machine probably, right? Yes it works perfectly as time machine. I have share made with quota just for time machine. To transcode yea you will have to research little bit on right model. And plex is testing hardware transcoding right now which helps a ton if your model has right CPU. Their own video server app does hardware transcoding on some models too and their app is on a lot of platforms. I researched some before buying but once I got mine and learned more and more on it I was little upset that I didn't get one model up but still am extremely happy with mine. Love my 716+II. And it cost less than this. (Well drives are not included so that may be their higher price.) And does so much more. But maybe they don't want to pay macrumors for advertisement articles. does it support torrent like Synology? Doesn't even show a OS for it. Just scan a QR code for setup and that's it. Synology OS is great and easy to use. And they have been on top of security since the ransom ware thing years ago. Not seeing any mention of how to setup security for this on their site.